Travel to the country of the coin, Take a Picture there with your Atlas Kit, Tag Us (@TributeProducts) on Instagram. And, First Round’s on Us! 10 ml glass vial to hold the world by picking little pieces of the world from each part of the world to which you travel. Message in Bottle: to write one handwritten note to be put into yours or your traveler's Atlas, which will stay with them for all of their travels. Color in your adventures and invite your friends and family leave their mark as well by signing, drawing, and writing on your map. Travel Map- Designed to be the canvas of your travels by offering you the artistic freedom to color in your travels across the globe. And, as we like to say, traveling is much more than just marking off the places one's been, but it is about the people we meet and adventures we have along the way. And, because our Travel Maps are specifically designed to be brought along with your travels, this uniquely offers you the opportunity to capture your whole story and not just the places you've been by providing space for friends, family, and fellow travelers you've met along the way to leave their mark as well with handwritten messages, notes, signatures, pictures, etc. Therefore, allowing your canvas to display the truest reflection of your travels. Designed to be hung in one's home between their travels, so that colors can tell one's story, the handwritten notes from friends and family support it, all while the white space simply tells one where their next adventures lies. Atlas Bottle (10 ml Glass Vial)- Provided to be used as an unique way to collect and save the places of one’s travels. Done by collecting a small pebble or grains of sand/dirt from each place one visits and saving it in their Atlas. A project so grand and just-possible that it should take any traveler a lifetime to complete. The objective is to ultimately color in every country on their Travel Map and collect a small piece of world from all those places in their Atlas so that they are in effect holding the whole world just like Atlas, the Greek God. 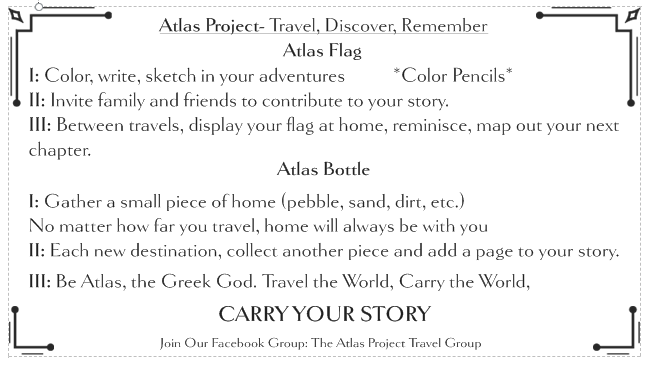 Message in a Bottle: Each kit also contains a small slip of paper in case you would like to write a small handwritten note that is can be put into your Traveler's Atlas and that will stay with them for all of their travels. Now, the Atlas Project isn't just some summer project or year long project, like traveling, it is meant to be a life pursuit. Therefore, the message you write will not just last a year or two but decades, so that ten, twenty, thirty years from now when the traveler of your life, be it your son or daughter, nephew or niece, mom or dad, aunt or uncle, grandma or grandpa or just a good friend, walk up those stairs to the top of the Great Wall of China and goes to pick up that small piece of it to put it into their Atlas. There you will be with your handwritten note rolled up saying, "...."- Well, that is for you to decide!